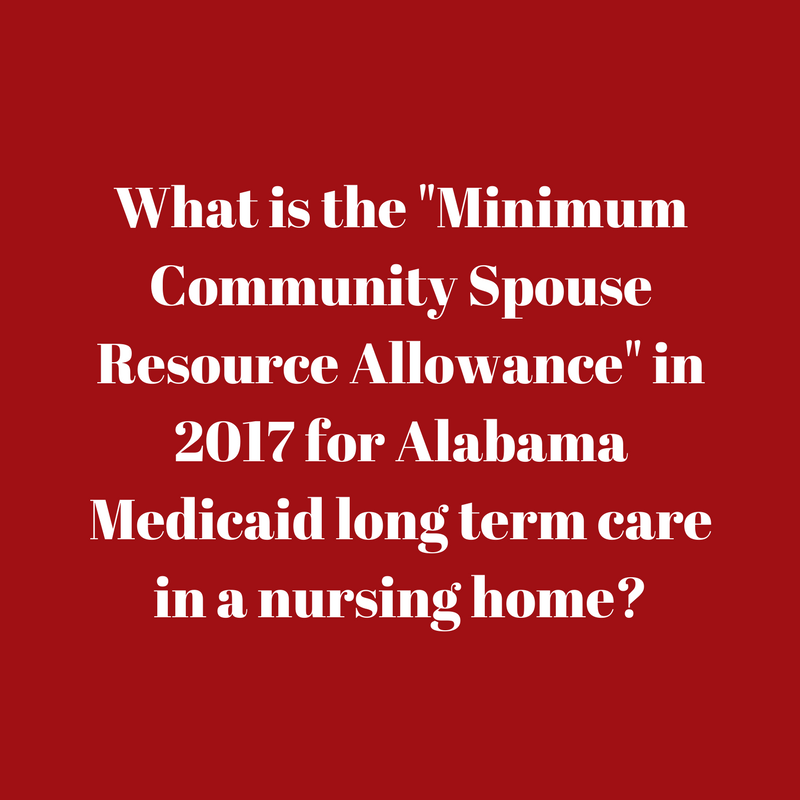 What is the minimum community spouse resource allowance in 2017 for Alabama Medicaid? Continuing our series on Alabama Medicaid in 2017 to pay for a nursing home, we previously talked about the $2,000 that the spouse (or single person) going into the nursing home could keep. Now let’s turn our attention to the spouse who is living at home — how much in the way of assets can they keep? This is known as the “Minimum Community Spouse Resource Allowance”. First let’s break this phrase down to understand it. Minimum — this is the “floor”. We’ll talk about the “maximum” or “ceiling” in a different article. Community spouse — this is the spouse living at home. (The spouse in the nursing home is called the “institutional spouse”). Resource — this is Alabama Medicaid’s word for assets or net worth. Allowance — the amount you can keep. You are “allowed” to keep this. Second, what is the amount? Do keep in mind there are assets/resources that do not count towards this number — see item four below. Third, how do we figure the amount? We find what’s known as the “snapshot date” (covered in a future article) and on that date we take a “snapshot” of the assets of the family. We exclude certain assets (such as the house) to get the available resources. We then divide that number in half. Each spouse gets an equal share. Remember, however, that the institutional spouse (going into the nursing home) can only keep $2,000. Here’s a few examples — assume it is the husband going into the nursing home and the “community spouse” is the wife. Jim and Jill have $30,000 in assets that are countable. We divide these into two so each spouse gets $15,000. But this puts Jill below the minimum. So she actually keeps $27,000 even though that is much more than 50%. We divide in half, but then we make sure the community spouse has at least $27,000. So Jim gets $3,000 ($30,000 minus $27,000). He can only keep $2,000, so we have to do something with the other $1,000. Bob and Sally have $17,000 in countable assets. We divide this money into two (so each spouse gets 50%) and this gives us $8,500. But since that’s below the limit of $27,000 for Sally, then she would keep all the assets. Terry and Cheri have $88,000 in countable assets. We divide the $88,000 into two and each spouse gets $44,000. Cheri is over the $27,000 minimum so she keeps $44,000. Terry has $44,000 but remember he can only keep $2,000 as the spouse going into the nursing home. So we’ll need to do something with that “excess” of $42,000. Brian and Lisa have $400,000 in countable assets. So Lisa is definitely over the minimum. Actually, she is over the maximum that we’ll discuss in a future article. Brian is also well over the maximum he can keep. We would need to take the right steps at the right time to preserve as much of the excess assets as possible. Fourth, is there anything else the community spouse can keep? Without listing everything, it is the basic items of life and planning a funeral. By far the biggest thing is the house. Fifth, remember that the community spouse may receive part of the income of the spouse going into the nursing home. This article is focused on resources (assets) but do remember if the community spouse living at home makes too little income then we can divert part of the institutional spouse’s income to the community spouse. 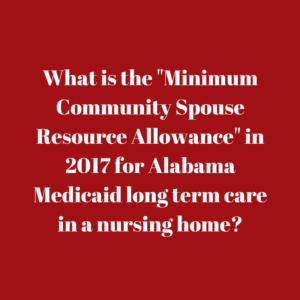 This is so the community spouse living at home will have enough income to live on — at least the minimum that Alabama Medicaid has set which is $2,002. Sixth, we’ll look next at the maximum amount the community spouse can keep. This will be our next article. A quick preview is the maximum amount for the community spouse in terms of assets/resources is $120,900. Finally, if you have questions about Alabama Medicaid, what’s the best way to get answers? This is a very complicated area of the law. We often see families with the best of intentions make decisions without advice from the right professionals and that can prove disastrous. We have seen what seems like “tiny mistakes” cost families tens or hundreds of thousands of dollars. And often there is no way to unring the bell — to undo the mistake. So if you are interested in getting good advice — which may or may not be to hire a lawyer — then give us a call at 205-879-2447 or fill out our contact form. We’ll go over your options with you and if you decide to hire us, you’ll feel comfortable with our flat price (no hourly rate) and our unique Medicaid guarantee. This will give you confidence that you are making the right decision during a very difficult period of your life. Thank you for reading this article….